The Hop-On, Hop-Off cruise operates between 9:40am and 3:20pm.It runs every 30 minutes during April to October. The frequency reduces during winter. A full loop takes 120 to 150 minutes. The Hop-On, Hop-Off cruise runs every 60 minutes from April to September and every 120 minutes in October. A full loop takes 120 minutes. Your hop-on, hop-off ticket is valid for either 24 or 48 hours. You can board the Hop-On, Hop-Off cruise at any of the designated stops and exchange the voucher. You can also visit our City Sightseeing® Venezia Visitor Center, where you can ask for more information on the service. Situated inside the Train Station Venenzia Santa Lucia next to ‘Freccia Club Trenitalia’, in front of platforms 13 and 14. You may end the cruise at any of the stops. Discover Venice on a relaxed hop-on, hop-off cruise with stops closer to the major attractions. Built on an archipelago of 118 small islands, every nook and corner of Venice has a history of its own. The city is connected by over 400 bridges and crossed by 150 canals, and can only be explored on foot or by boat. The Venice Hop-On, Hop-Off cruise allows you to discover the city at your own pace as you can hop on and off the boat as many times as you wish. You may choose between a 24-hour ticket and a 48-hour ticket. 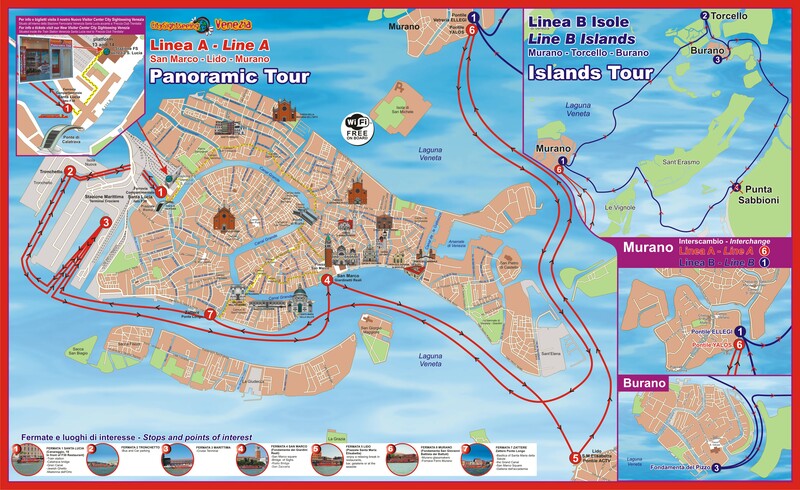 Enjoy Venice sightseeing the easy and convenient way: Hop on the cruise at any of the stops. Your hop-on, hop-off boat covers all the major highlights of Venice, such as, Piazza San Marco, the beaches of Lido and the Island of Murano amongst others. While on board sit back and relax while the Hop-On, Hop-Off boat cruises along the canal and offers beautiful views of the city. The Venice Hop-On, Hop-Off Cruise allows you to plan your own sightseeing. You may hop on and hop off at any of the designated stops and spend as much time sightseeing, shopping or eating before hopping back again when the next boat comes along. Your hop-on, hop-off ticket comes with two validity options - 24 hours and 48 hours. There are two Lines A and B. You can also sit back and relax on the boat and enjoy the views of the city from the canal. The cruise operates every day throughout the year, however the sailing times are subject to change and are set in conjunction with the local authority. You can download FREE APP of our local partner called SIGHTSEEING EXPERIENCE; it is available in 5 different languages and helps you to check your position on the city Sightseeing Map, so that you can easily see how to get to the nearest stop. You can even see the cruise position in real time of all our cruises and check the waiting time for the next cruise at each cruise stop. You can download it on Google play or App store. Your voucher will be valid for 3 months from the date chosen at the time of booking. Line B is operational only in summer. The access to the cruise is permitted for little and medium domestic animals under the discretion of the driver. Using muzzle and leash is mandatory and the holder must assure that the pet carrier is not in a poor state or that it does not contain food. The owner or the holder of the animal is liable for any damage caused by the animal. For safety reasons it is strictly forbidden to bring luggage, awkward bags, big backpacks or bulky baggage on board the City Sightseeing cruises. The boat is always on time. The over-all experience is wonderful. Would have said excellent, shall they would have received commentary on the boat, appeared they did in the past but no longer have. If you spend the three days in Venice, worth getting a pass for each day, as it works out cheaper than using the public transport. Dont just spend your time on San Marco, get out to the islands, yeah it is time consuming and a bit rushed but you will enjoy it. Once on Lido, you wont even feel that you are in Venice.